20 doses of measles vaccine to protect children from this deadly disease. 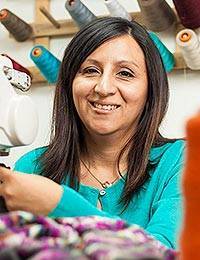 Involved with textiles and clothing from a young age, Ana Fernandez is excited to present her own design in this Peruvian cardigan. Featuring a jacquard design in 100% alpaca wool, this sweater is covered in cherry red and magenta floral motifs, closing in the front with coconut shell buttons. Take your measurements with the tape measure over your undergarments. If your measurements fall between sizes you may prefer the next larger size. Inseam, skirt and dress lengths vary by style and will be listed in the item description. Our sweaters are knit in standard sizes, however actual measurements vary by style. Measure around the body approximately 4 cm below the natural waist (above). This is the area where most pants and skirts actually fit. Standing with your heels together, measure around the fullest part of the body approximately 17 cm - 20 cm below the waist. Our standard inseam length for women is approximately 81 cm and 86 cm for men; however inseam measurements will vary slightly by style. Every item you buy on UNICEF Market helps change a child’s life. With donor support, UNICEF works in the world's toughest places to ensure children are fed, vaccinated, educated and protected. We're for every child, no matter what. And we'll never give up. Less than 20% of children with acute malnutrition get the treatment they need. Your purchase helps UNICEF reach them with life-saving nutrition. Stay up to date with UNICEF news, programs and appeals.